This false-color image of cloud features seen on Venus by the Venus Monitoring Camera (VMC) on the European Space Agency's Venus Express. The image was captured from a distance of 30,000 km on December 8, 2011. The howling, hurricane-force winds of Venus are blowing even faster lately, and scientists aren't sure why. 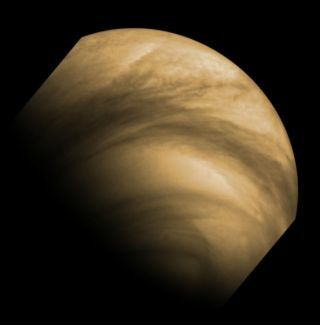 Average cloud-top wind speeds on Venus rose 33 percent between 2006 and 2012, jumping from 186 mph (300 km/h) to 249 mph (400 km/h), observations by Europe's Venus Express orbiter show. The strange winds of Earth's "sister planet" have long intrigued researchers. Venus has a super-rotating atmosphere that whips around the planet once every four Earth days; Venus itself takes 243 Earth days to complete one rotation. European Space Agency officials described the strong Venusian winds as "super-hurricane-force" phenomena. Khatuntsev and his team determined wind speeds by studying images captured by Venus Express between 50 degrees north and south latitude. The researchers tracked the movements of tens of thousands of features in the cloud tops some 43 miles (70 kilometers) above the planet's surface. Their work has been accepted for publication in the journal Icarus. A Japanese-led team also tracked cloud movements using Venus Express data in a separate but complementary study that will be published in the Journal of Geophysical Research. "Our analysis of cloud motions at low latitudes in the southern hemisphere showed that over the six years of study the velocity of the winds changed by up 70 km/h over a time scale of 255 Earth days — slightly longer than a year on Venus," lead author Toru Kouyama, of the Information Technology Research Institute in Ibaraki, Japan, said in a statement. Both new studies also detected regular variations in the atmosphere of Venus that appear to be linked to the rotational period of the planet, the local time of day and the height of the sun above the horizon, researchers said. And both teams saw surprising and dramatic variations in wind speed, sometimes in as little as 24 hours. Sometimes clouds took 3.9 days to zip all the way around Venus, for example, while on other occasions the journey required 5.3 days. The reasons for such shifts, as well as the long-term increase in wind speed, remain mysterious, scientists said. "Although there is clear evidence that the average global wind speeds have increased, further investigations are needed in order to explain what drives the atmospheric circulation patterns that are responsible, and to explain the changes seen in localized areas on shorter timescales," Venus Express project scientist Håkan Svedhem said in a statement. "The atmospheric super-rotation of Venus is one of the great unexplained mysteries of the solar system," Svedhem added. "These results add more mystery to it, as Venus Express continues to surprise us with its ongoing observations of this dynamic, changing planet."